Click here to see our meetings times & venues. 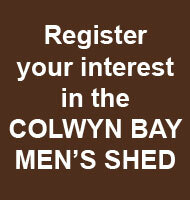 If you would like to register an interest in the Colwyn Shed please use the 'Register' page. Alternatively you can contact us via email. If your enquiry is urgent you may call our Secretary, Malcolm Worth, on 07986 315853.